The HQ Symphony Pro Foil kite series is for beginner to intermediate flyers. This kite is built durable and has easy handling for a foil kite. The Symphony is of fun on the beach or in the field all you need is wind. The Elliptical shaped sail generate a generous amount of pull and speed for its class. The bridle setup allows the symphony 2.2 to relaunch without help and frustration. 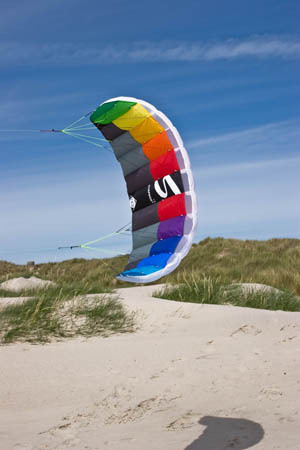 This kite is available in a Rainbow color scheme as well.